Four of the women last year with famous bread maker, "Sister Apples"
Ever thought religious life might be for you? If you would like to get to know the Felicians and spend some time in prayer to consider the possibility, there will be a Discernment Retreat from May 31 to June 2 in Enfield, CT! You will spend some time with the four of us novices and get to meet our lovely Sisters at Our Lady of the Angels Convent. Last year we had dinner and prayers together and plenty of time to visit. There will be time for quiet and time for you to talk with other women who are also considering the possibility. If you're interested you can call Sister Mary Beth at 815-200-2393 or email her at smarybeth@feliciansisters.org. She can answer any questions you may have concerning transportation, food, or lodging. So don't be shy, we would love to have you there! 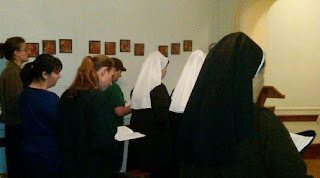 The women who come to visit always enjoy the company they find in the Sisters and with each other. No one ever wants to leave! In fact, two of the women who attended in October 2012 decided to become Candidates, so they are now journeying together with us. The retreat is not meant to be a commitment of any sort, just some time for you to see if this might be where God is calling you. In praying about whether or not this might be the place for you, you will definitely find friendship and insights that will last beyond the weekend. 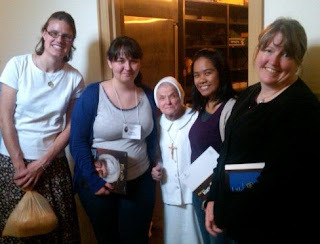 I always enjoy getting to know the women who are thinking about religious life and oftentimes we stay in touch afterward. It's exciting for me to talk with others about how God is working in their lives, especially when we find similar patterns in our stories! If you have any questions about religious life in general before attending the retreat weekend, I would be glad to try and provide some answers. You can post a question in the comment section below or send an email my way at desimarie@feliciansisters.org.